There is more data generated in businesses than ever before, and there are more and more ways to store data and use it. SAP Data Hub provides a simple, scalable approach to manage data and to integrate, process and govern it. This document describes the reference architecture for SAP Data Hub 2.3 deployed on SUSE CaaS Platform, integrated with SUSE Enterprise Storage. 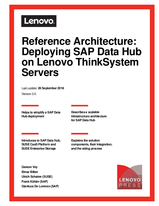 This paper is intended to provide planning, design considerations, and best practices for implementing SAP Data Hub on-premise, with Lenovo products. Lenovo ThinkSystem servers are designed to deliver the capabilities you need to exceed today’s needs, while preparing you for the next wave of innovation. These systems are purpose-built to deliver performance, security and agility in an open environment that won’t limit your options down the road. The intended audience of this document is IT professionals, technical architects, sales engineers, and consultants to assist in planning, designing and implementing SAP Data Hub.